Historical Preservation and the Arts In Detroit. The Detroit Institute of Arts Museum is a multi-billion dollar set of 100 fine arts galleries that comprise a National Historic Place in the United States, located at the Wayne State University. The museum is only one of several installations included in and near the Detroit Cultural Center Historic District surrounding Woodward Avenue. The Museum of Contemporary Art Detroit (MOCAD) is nearby and presents different exhibitions year round, although it does not purchase and collect art as does the DIA. The MOCAD admission rate is "pay what you can", with a $5.00 cap. DIA's admission is $8.00, $6.00 Seniors, $4.00 for youth ages 6-17, under 6 free. Historic club frequented for decades by local and other well known artists. Detroit may be bankrupt monetarily but we are well- funded in spirit and what it takes to come back. Across the street from the museum is the Main Branch of the Detroit Public Library and nearby is the Horace H. Rackham Education Memorial Building, whch hosts classes for the University of Michigan. All three are on the US National Record of Historic Places. The Detroit Historical Museum is also located on Woodward Avenue and contains a breathtaking display of local automobile history, including an operatonal two-story car body drop from a famous Cadillac plant. This midtown Cultural Center length of Woodward Avenue is also a US National Historic District. It has attracted a number of music and arts schools to the area, as well as a science center and the Charles H. Wright Museum of African American History. The Detroit Science Center closed in 2011 and reopened in 2012 as the Michigan Science Center after renovations and new funding sources were gained, including Chrysler. While some biased bloggers show a few pictures of abandoned houses, some already razed and replaced, with captions stating "This is all that's left of Detroit", a drive down Warren and Woodward Avenues proves this statement incorrect. I particularly noticed many active construction projects occurring in Detroit during extended visits in the summers of 2009 and 2011, located between I-75 and the center of the city. These projects and newer projects that turned abandoned houses and lots into beautiful gardens did not appear on blogger's sites whose writers seemed to wish Detroit to close down entirely. New gardens were plotted during summer 2013 as well. On my visits, both downtown libraries were full of people, although air conditioning was not available. Plenty of people were at the zoo just outside the downtown area and many people were renting bicycles from Wheelhouse Detroit and riding through Belle Isle streets in the Detroit River district. Businesses are still opening - Whole Foods opened a store in Midtown Detroit during early summer 2013. The East Ferry Avenue Historic District just east of the DIA is completely renovated and contains rows of townhouses as well as preserved 19th-century homes and mansions. This district was originally a farm that produced seeds for commercial sales until the owner split it into plots for residential dwellings. A walking tour of this area affords visitors with sights of architecture popular from 1880 through WWII, well maintained. This historic district is also known for its associations with Black history and art. 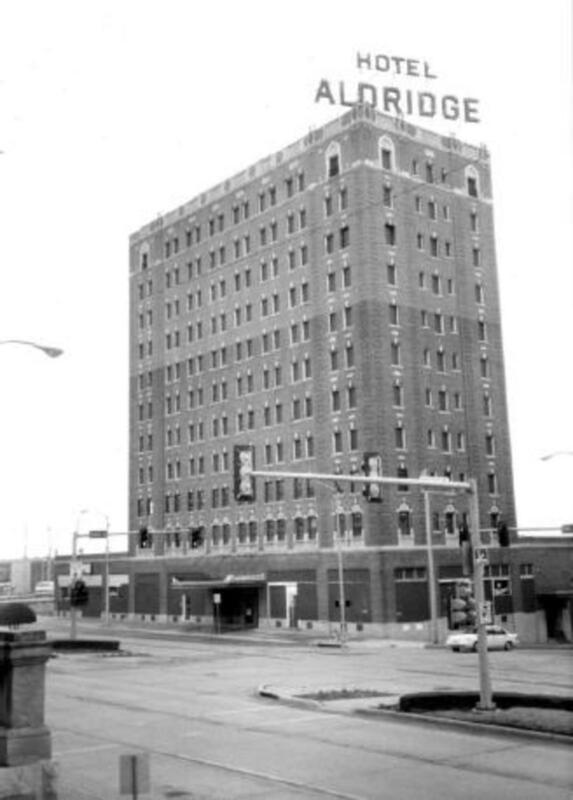 5510 Woodward Ave. : Colonel Frank Hecker of the Union Army worked for Union Pacific Railroad and formed his own rail car manufacturing company (Peninsular). 60 East Ferry Ave.: William Pungs worked for the Michigan railroad Supply Company. Then he began a carriage company and graduated to gasoline engine manufacturing. 71 East Ferry Ave.: Charles Freer was president of Peninsula Rail Car Works. A dedicated art collector, his gallery of paintings went to the Smithsonian instead of Detroit. 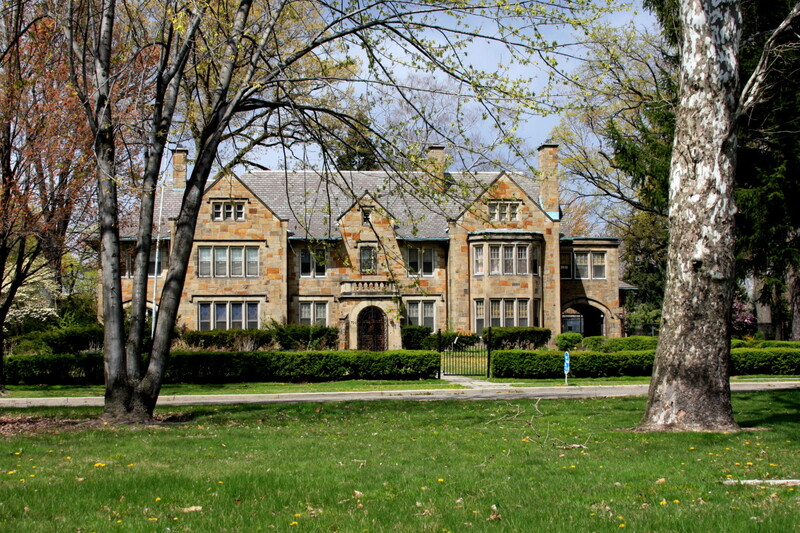 263 East Ferry Ave.: Once owned by the president of a mining company, this house became Lewis Business College in 1960, when the school founded in 1928 needed larger quarters. It moved again later to larger space and continued to specialize in education for African Americans until closure in 2013. 404 and 414 East Perry Ave.: Two homes were connected in order to become a medical facility specializing in healthcare for African Americans. 451 - 459 East Ferry Ave: The "Tuskegee Institute of the North" taught practical arts to thousands of students of all races who learned tailoring, laundry skills, and others here until 1952. The 33 buildings in this district also include homes and businesses once owned by famous Detroit department store owners as well as owners of mining companies, fur companies, and many other endeavors. East end of the East Ferry Street District. Over 200 adults and youth manage garden plots in the professionally landscaped Community Gardens in Midtown Detroit, especially around the DIA and neighborhoods to the east, like Ferry Avenue. Pop up restaurants appear in yards, warehouses, and other places around the area as a nice surprise to residents and visitors. Anthony Bourdain has featured them on television. The People Mover was always at least half full and I rode it many times - in the 1980s, it included just one short span from a hotel to a downtown vertical mall, but it now travels around all the major areas of Downtown Detroit. When you ride out over the Detroit River, you can see some of the newer park areas along the shore, as well as dazzling copper toned glass windows of downtown high rises.The art museum was well patronized on my visits and the eating places downtown were always packed full of people at lunchtime. The museums and libraries of Detroit capture all of these historical and current events. 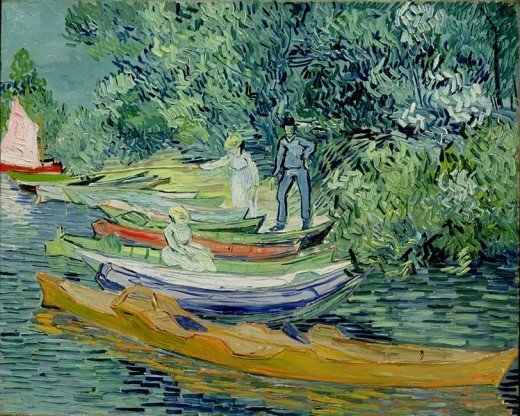 The DIA has also been an important part of returning stolen art works from the WWII Era to their rightful owners. 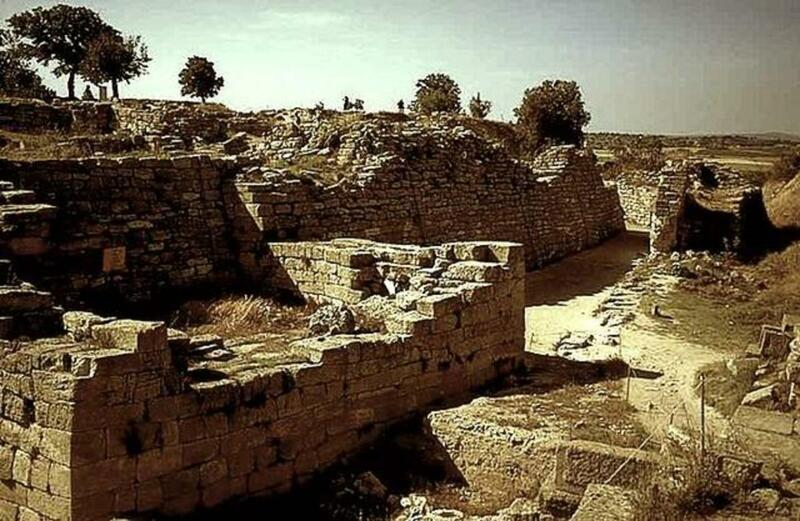 This preserves history for those owners and their countries, as well as to return valuable possessions. In addition, the museum continues to purchase art pieces from around the world and if any of them are recognized as belonging to other countries or individuals, then efforts are made to return them to the original owners. This is stated on the DIA website and is important to its director, Salvador Salort-Pons. 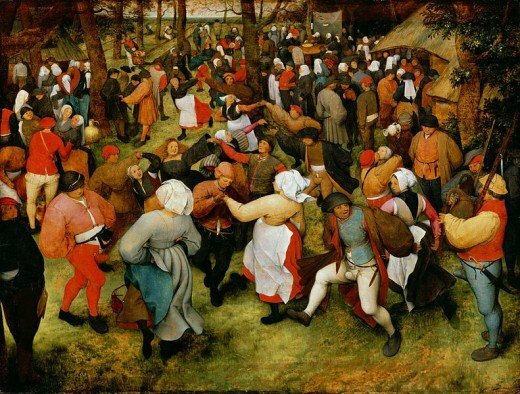 Pieter Bruegel the Elder - The Wedding Dance (1566). One of the most valuable pieces in the DAI collections. The arts on display at the DIA earn significant amounts of money through art covenants. A partial list of earnings in a year is listed below and taken from a longer list (of public record) offered in July 2013 by the Detroit Free Press (The DIA's Priceless Art: Mark Stryker http://www.freep.com/interactive/article/20130526/ENT05/305260067/DIA-sale-arts-Detroit-bankruptcy). Some works by local Michigan and Detroit artists are also among the valuable pieces that some authorities recommend for sale or auction. The Detroit Insitute of Art Museum earns billions of dollars every year in its art covenants (loosely, agreements to display and feature works of art). The total value of collections in 2013 is estimated to be over $30 billion. Another $22 million in funding comes for a property tax. The Window by Matisse is my favorite of his many window paintings. It is popular among visitors to the Detroit Institute of Arts Museum. A hallmark of the window paintings is the included M and sometimes H of the artist's initials, hidden in chair frames and the like. In The Window, you can see lines of MMMM or mmmm along curtain edges, inside a chair back, and even along the sections of a radiator. one analyst has found 40 "M" figures, all painted in black to match Matisse's signature. other objects are hidden in the painting as well, making a fun conversation piece to ad to the attractive coloring of the paints. 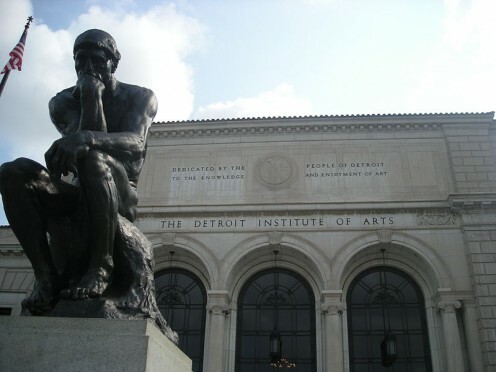 The Chapter 9 bankruptcy filing of the city administration in July 2013 brought suggestions that Detroit should sell the art collections at the Detroit Institute of Arts Museum, but the director of the facility was completely opposed to that idea. The original community that is the CIty of Detroit was founded in 1701 by French soldier Antoine de la Mothe Cadillac. A well known top-of-the-line automobile was named after him. The auto industry rose and much of it fell, but Ford Motors never took a government bailout from 2009 - 2012. 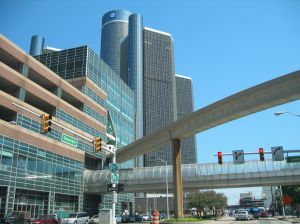 The company continued to add jobs near Detroit through 2014. 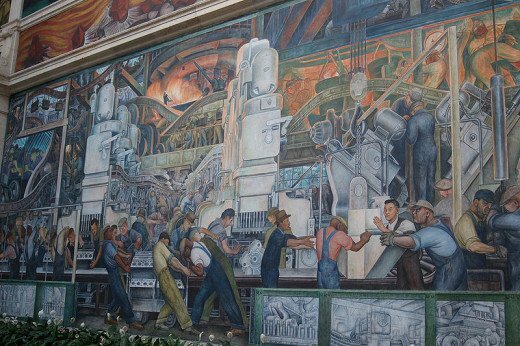 Auto history is vividly displayed at installations locally that include the Henry Ford Museum and works like the murals of Rivera in the DIA. Motown music legends became popular all over the world in the 1960s,but the population of Detroit had already declined in the 1950s and 1960s. Both phenomena are important historically to the city and America. At city's art museum is an integral part of Detroit history, containing important works by American and International artists. Detroit Emergency Manager Kevyn Orr planned to proceed through bankruptcy from July - September 2013, insisting the art collections in the museum be used as assets in the case, but the DIA leaders fought against this and finally won. 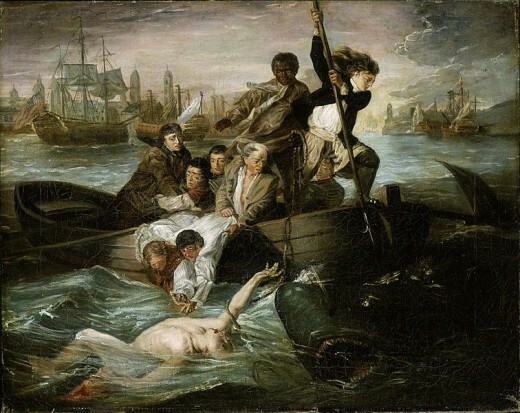 Orr later apologized for his suggestion to sell the art collections. 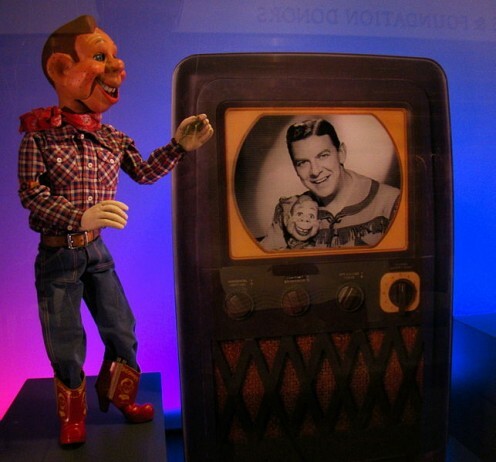 Radio talk shows were filled with stories about both phenomena during July 2013, including related books written. One of these is books is Devil's Night: And Other True Stories Of Detroit by Zev Chafets in 1991, which includes historical analysis of the riots and population flight in the 1960s that occurred after one Halloween related event turned to arson and other destruction. The book is a high priced collectible item today, even though it is less than 100 pages long. The Detroit art collections were saved in late 2014 by nearly one billion dollars in private donations. many of the collections have been put into a trust that cannot be sold, and three counties contribute tax funds to the facility. A centerpiece of the museum is the Diego Rivera Court, a skylighted area lined with 27 panels of Mexican mural art done by the famous artist. He painted the panels within eleven months, from spring to spring in 1932 to1933. The panels begin on the east wall of this open area within the museum and proceed clockwise around the compass points. 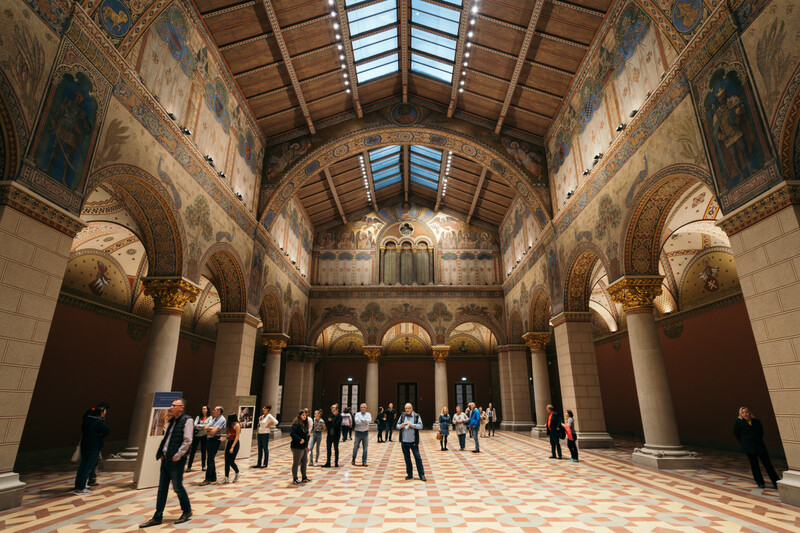 A virtual tour of the Rivera Court is available for iPad users. If you have an iPad, go to the app store, search for “Detroit Industry murals” or “Detroit Institute of Arts” and download the free app. These 1933 murals have always been controversial, because Rivera was a Marxist. 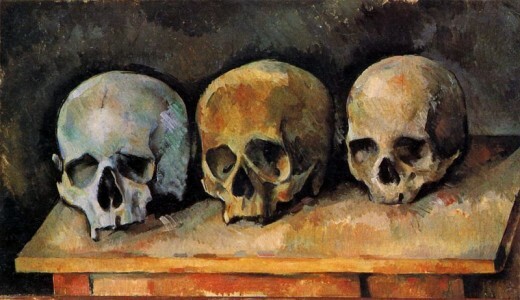 Some individuals wanted nothing to do with art done by a Marxist in 1933 and some have the same feelings today. The work programs of The Great Depression provided under President Franklin D. Roosevelt impacted the arts as well as US roads and parks, and other voices spoke out against "wasting" federal money on arts. 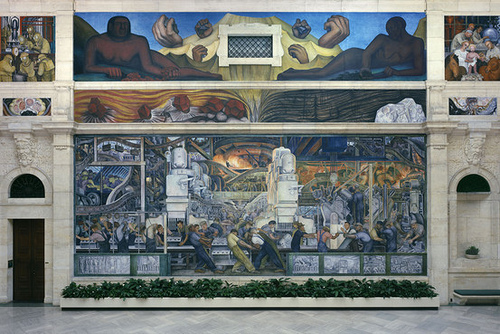 However, Edsel Ford (Henry Ford's son) paid for the Rivera murals himself when he was Director of the DIA. No public money was spent on them. The scenes in the 27 different parts of the murals show positive and negative aspects of industry. Some individuals do not like that presentation, feeling that industry is totally positive. Others feel it is totally negative. When we see war planes and passenger planes depicted together as opposities, it is hard think that industry is totally good or bad. Ask anyone with an Industrial Injury or a cancer that is work related, and that person is likely to find something negative about industry. 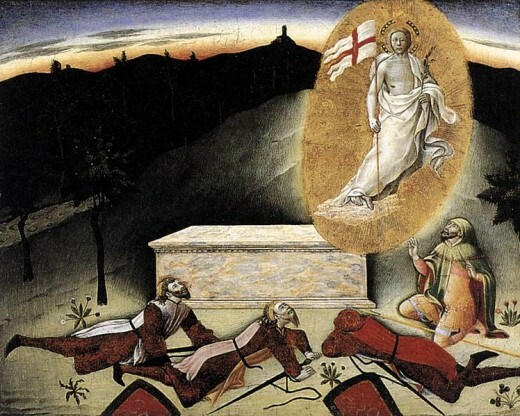 Another controversy is a medical depiction. 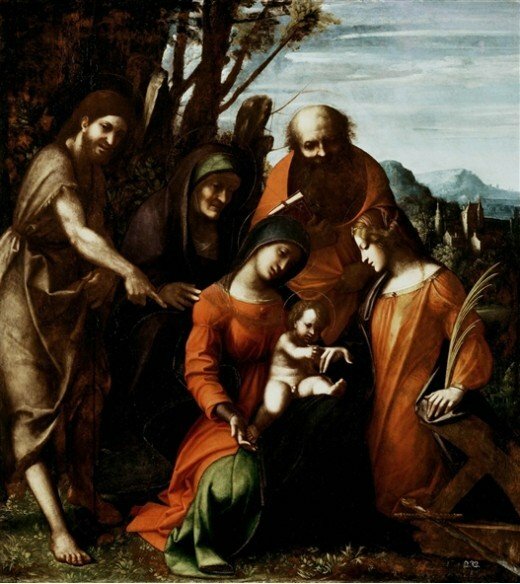 It portrays the Nativity as having Joseph as a doctor and Mary as a Nurse. It was likely an honor to the medical profession, but not all visitors interpret the scene as positive - the Baby is receiving a vaccination. Still, the murals are beautifully colored frescoes. It would be destructive to remove walls in order to sell them; they may also be the property of the Ford estate, on a sort of loan to DIA. Detroit is full of controversy. I love Detroit, myself! Never gone boating yet on the Detroit River, but I'm due for another viisit. I'll be looking for more sights to see! I have family who resides in Detroit. 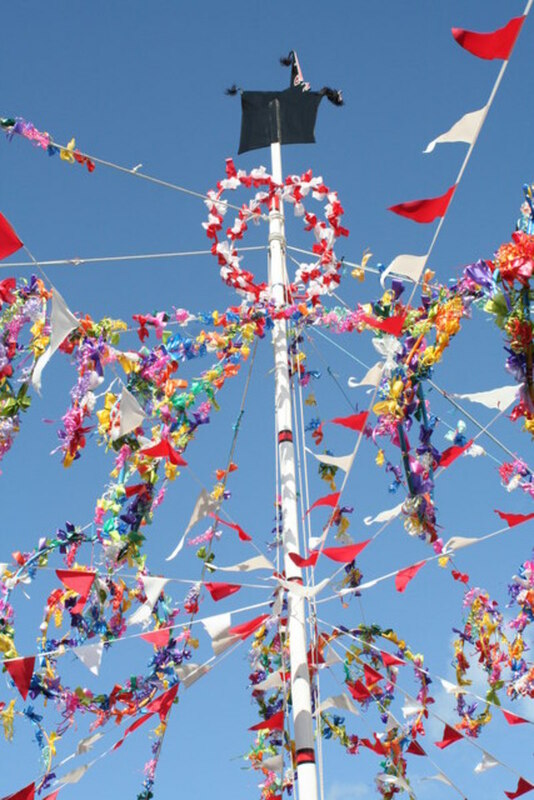 Therefor over the years, I have visited many times and taken in the sights as well as enjoyed boating. Truly appreciate you sharing such an informative article about this city. Ms. Franklin is a good example of faith and sticking with a place worthy of loyalty, as are my friends like Sean Robertson. They make their own work and carry others higher with them, creating jobs. Right now, there are many other jobs vacant as well (about 85,000 in July 2013), because others residents have moved away. At the same time, the city is razing abandoned buildings, as is my hometown, and putting garden plots into them that citizens maintain. I have hope for Detroit - places like the art museum draw people in. Thanks for sharing some history, some art, some architecture and the spirit of Detroit. I lived in Michigan for a number of years and never became familiar with Detroit. That city always seemed more than I could handle. Thanks for the view you offered in this article. Aretha Franklin's quote is so hopeful and inspiring.